We have a variety of chains in various lengths and materials. 16" box link sterling silver PLATED chain. 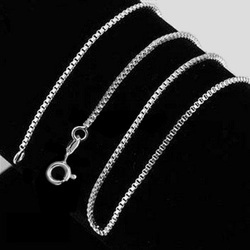 18" box link sterling silver PLATED chain. 20" box link sterling silver PLATED chain. 16" box link sterling silver chain. 18" box link sterling silver chain. 20" box link sterling silver chain. 16" box link 10K gold chain. 18" box link 10K gold chain. 20" box link 10K gold chain. 16" box link 14K gold chain. 18" box link 14K gold chain. 20" box link 14K gold chain. A relative idea of how a chain sits on an average size person.